I have been following this thread for some time now and I have to say I often find myself sitting in amazement in front of the screen. Both TTT and EW are techniques I had either never heard of ( Taylor) or never considered worth studying (EW) and I'm happy to now see them used in a fascinating conjunction ! I am now seriously reconsidering studying EW and have also the TTT book now on my "to buy list" ! With regard to the question asked above concerning the fib clusters...are there any tips and hints to be found in EW books ? This may sound dumb, but I wonder if there are any rules for drawing fibonacci extensions and retracements ? I find it hard to replicate your fib cluster zones in your charts, that's why I'm asking. I have drawn many fib zones in my charts in the past and also looked for confluences, but I often found them to be not relevant...they were nowhere as accurate as Larry's. And regarding the mentioned "indicator", was ddkk refering to the "decision point" ? I thought it comes with Market Predictor, but I might be wrong. Anyway, please keep on posting, Richbois and Larry22, it's highly appreciated ! P.S. @ Richbois: I will order the original TTT e-book through you once my Paypal acc. is funded again ! Hi Martin, I must say first that when I talk about the TTT book I refer to Richard's TTT Excel spreadsheet as I have to admit I have never read the book and don't feel the need to do so as all I need is in Ricard's Excel spreadsheet he is the expert who translated Taylor's technique to an Excel spreadsheet so since I spend a lot of my time on EW and Fib clusters all I have to do is look at the Richard's TTT spreadsheet and find today's odds and expected high's and low's then compare that with the numbers I have then I put all of this together then I base my trading accordingly to that. For the Fib clusters I must say that you need to understand the main concept of EW and I can understand then what is easy for me may not be the case for others. Considering that it would not be easy to show this on a forum I will have to think if one day I could give some kind of webinar but again I would not do this for free so not sure there would be interest for that. Laurent, are going to be at Rich's sat. training? Maybe you can discuss your webinar? Thank you, Richard, for great summary. Martin, I was refering to covered "indicator" at the bottom of Laurent charts, but DP is from MTPredictor. Laurent is a good friend of mine and I managed to convince him to post on this forum to show how he uses EW and TTT to trade. He has other proprietary indicators that he uses that he is not ready to share at this time and we should not expect him to do so. What Laurent does took him countless hours and energy to learn and master and he is gracious enough to give us some of his knowledge. If he was to even give all his findings and tricks all at once it would be very hard to assimilate all in one swoop. Laurent has family commitments on Saturday and won't be able to join us on the conference call. Laurent is trading for a living and his first priority is to provide for his family. I am trying to convince him to produce a DVD that would explain how he uses EW,DPs and TTT in detail. That too takes time to produce and that would take him away from his trading. Therefore he would be looking for compensation for that. I hope you all understand and appreciate the situation. Today was a SS day. TF opened below the Buy day low and therefore as mentioned is last night's report we had a 90% chance of getting above 703.60 at some time during the session and that was achieved. The others were far from the average 3 day rally, therefore the expect rally was to be anticipated. 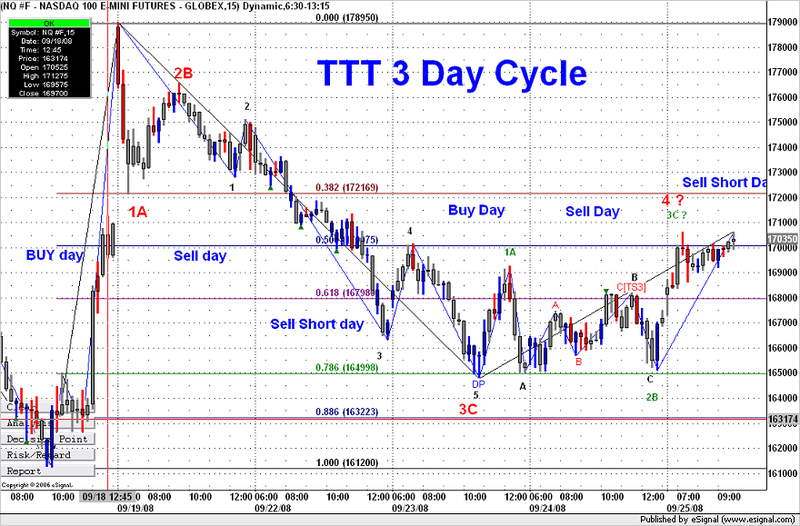 Using the same chart we can also see the TTT pattern for the last 2 cycles. and came down to close as a normal average 3 day rally. Sept 23 starts a new cycle. We had done a good decline already but we had a 62% chance of making a lower low and that was accomplished. Sept 24 the Sell day (confusing day) we rallied a bit but it was more a back and fill day.But as you can see that completed our wave 2B. Today based on the count and the TTT average 3 day rally projections it was very reasonable to expect the rally we had. Laurent, 1st in line for your webinar. thanks for the replies. I will do some studying of EW and TTT myself first. I fully understand Laurents points. There is absolutely no obligation to teach others EW for free. Should you ever consider to share some of your knowledge with others, I'd be very happy. I forgot to mention I made close to 8.3 points on the first trade (2 lots) and an average of 3 points on 2 lot as I had to exit before the end. P.S I always buy 2 lots and exit the first one at 1.3 point from my entry price. That is a little gem - I wonder how many realize the value of that piece of info about the way you trade. This forum has become a great resource.